Running your own business—free of the hassles of working in corporate America —is supposed to be exciting and energizing. So why do you feel so worn out? Your exhaustion may have more to do with the nature of work in the 21st century than being an entrepreneur. And you’re not alone in feeling that way. Nearly half of U.S. adults surveyed said they are often or always exhausted because of work—a 32% increase from 10 years ago, according to an analysis of General Social Survey of 2016 published in Harvard Business Review. Their emotional exhaustion often leads to feelings of loneliness, noted co-authors Emma Seppala, Ph.D., the science director of Stanford University’s Center for Compassion and Altruism Research and Education, and Marissa King, Ph.D., professor of organizational behavior at the Yale School of Management. The results were “pervasive across professions, and up and down corporate hierarchies,” they wrote. Fortunately, it’s possible to reverse burnout and prevent it from creeping back in the future. Here are some strategies that will help you get your mojo back at work. Seppala and King recommend building a workplace culture that encourages community and places value on “warm, friendly, and understanding relationships between people.” One way to do this is by finding creative ways to celebrate collective successes, they say. Keep your eye out for achievements to celebrate—whether it is attracting a new account or winning an industry award—and look for inexpensive ways to recognize your team for contributing, whether that is by having an ice cream tasting party or ending work early one afternoon to watch a comedy movie and eat popcorn. Connecting with friends and family outside of work is important too. Instead of jumping on social media when you get home from work—a superficial type of contact that can contribute to feelings of isolation–make plans to see a friend in person or do something fun with family. Long hours at work can contribute to burnout—and many of us are putting in more time at the office. The average American work week was 44 hours, according to Gallup research last summer, and the average amount of time spent checking in with work via electronic devices was 6.3 hours per week. Fortunately, there’s something you can do about it, as a company owner. Look at your schedule from a 20,000-foot perspective to see if there are ways to cut down on the hours you spend working. Are you attending meetings with prospects that aren’t leading anywhere, because no one qualified the prospects? Are you “putting out fires” because poorly trained employees keep making mistakes you have to fix? Are you spending time on rote tasks like scheduling appointments that could be done using an automated system like ScheduleOnce? Even a short-term policy like setting summer Fridays can help you get some R&R and refresh your perspective. In a survey by Gartner, 42% of more than 200 employers were offering Fridays off this summer. Not only will a policy like this help you avoid burnout but it will give your employees time to recharge, too—raising the overall mood in the office. We all encounter situations and people that drain us, instead of energizing us. If you find you’re not spending time on activities that fill you with energy and excitement, it’s time to make some room in your life for them. Take stock of the situations at work that cause you the most anxiety and stress and look for ways to prevent or eliminate them. Are you lying awake at night worrying about managing a high-maintenance client? Are you stressed out from dealing with a vendor who keeps failing to deliver? Are you constantly listening to complaints from your team about an employee who keeps causing drama and strife? Learning new techniques for managing the situations you can’t change–perhaps by working with a business coach or taking a leadership course—and ending relationships that are no longer productive can give you a new lease on life. We all know that activities like exercise and meditation are good for us, but closing the knowing doing gap can be hard. It’s easy to cancel a morning yoga class when a report is due to a client or to skip a meditation session if a child gets sick and you’re scrambling to find childcare or work from home. By putting your wellness activities into your calendar a week or ideally a month ahead of time, you’ll increase the likelihood you will stick with them. Even if you have to go to a plan B, like doing your high-intensity workout at home with the help of a video at 9 pm instead of at your usual gym, you’ll be more likely to get it done if you’ve already set an intention to fit it into your day. Remember, scheduling time to take care of yourself can go a long way toward arriving at work full of energy and enthusiasm. 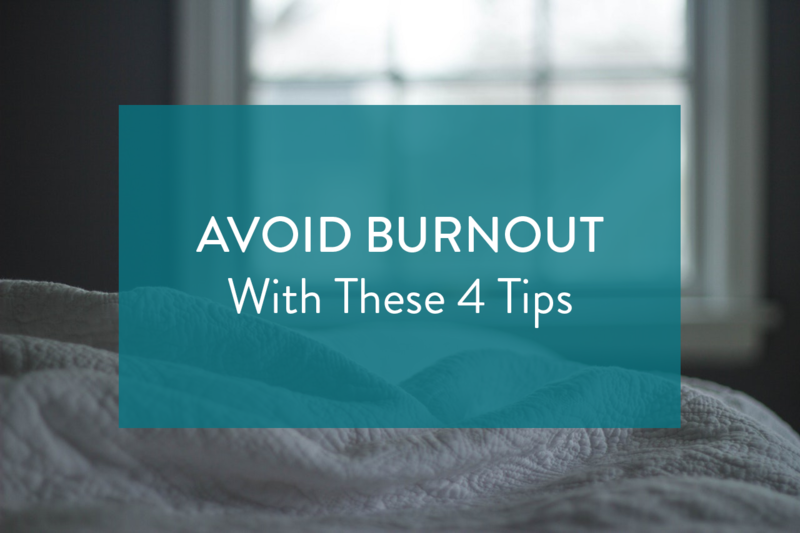 And it’ll make it a lot easier to avoid burnout.